Opening cans is easy with the Garde COHH-LC large handheld crank can opener! Featuring a crank-style handle, this opener provides maximum leverage and comfort for the operator, allowing you to easily slice through can after can without fatigue. More controlled than a standard manual can opener, the crank design will allow your staff to open more cans and speed up your food prep process. I am on my 4th can opener. We open 15 #10 cans a week, and this can opener will last about a month. Maybe it isn't designed for large cans, but why would it be for sale on web restaurant. I keep buying these and smaller versions and local stores, Does anyone know of a good can opener out there? Its really silly when you think about it. Wasting time,because i can't get the cans open. Thank you for your review, Jeremy! We are sorry this Garde COHH-LC Large Handheld Crank Can Opener has not worked well for you. A Customer Solutions Representative will contact you soon! Did last only about 5 sweet sweet months. Then, to our great dismay, it no longer had the strength to gain us much needed access to our canned goods. Thank you for your feedback! We are sorry your Garde COHH-LC Large Handheld Crank Can Opener was defective. Corrective action has been taken and a Customer Solutions Representative has reached out to you. If you need recommendations, please let our Customer Solutions team know. This large handheld crank can opener works as advertised. It is easy to use and does the job. It's cheap enough to have several around. Was hoping it was just a bad set of can opener but I bought this twice and both have worn out after 2-3 weeks of use. Can't say I will buy this again. Thank you for your review, Will! We are sorry this Garde COHH-LC Large Handheld Crank Can Opener has not worked well for you. A Customer Solutions Representative will contact you soon! The Garde large handheld CanOpener works very well. It has a smooth cutting operation that is easy to use and works better than the previous electric one we had. Great large size can opener. Zips right through #10 cans easily and comfortably. Another plus is the large size make it difficult to lose in a busy BOH environment. Concept with the large handle was great...actual use of this opener not so great. It worked well the first few times we used it but quickly broke down as the gears get easily bent. I don't recommend this. Thank you for your review, Shannon! We are sorry this Garde COHH-LC Large Handheld Crank Can Opener has not worked well for you. A Customer Solutions Representative will contact you soon! I'm not really too sure of this can opener. I purchased 4 of them and 2 seem to work great. 2 I had to throw out. Maybe #10 cans are too much? Thank you for the review andrew hefele. We’re sorry this has not worked well for you. For an alternative that might better meet your needs, try this Garde COM1NB Heavy Duty #10 Manual Can Opener instead! I don't thing you will find a better hand crank opener on the market. I use these on small cans up to #10 cans and they get the job done fast. It does the job but is pretty flimsy. If you know this going in, you will know to be gentle with it and then it should hold up. If you attack the cans with reckless abandon, you will break this product. Pretty good value overall. I got my can opener already a couple of weeks ago, but I wanted to try it before to see if it really is very bad as they say here in the other reviews. Well, I have my conclusion ..... and I really do not understand why they say it does not work! It works perfectly for me! I loved it, it makes my job much faster! Really isn’t the best for large size cans. We only got a few uses out of it before it broke. We have purchased a larger can opener. I bought this & upon first use, it seemed fantastic. After a dozen uses, it stopped clamping onto the lips of the cans. Occasionally, after numerous tries at a 45 degree angle, it will grasp & hold. I was hopeful it would be a good addition to my kitchen. Thank you for the review! We’re sorry this is not working for what you need it for. We suggest trying this Swing-A-Way Large Crank Can Opener with Pivot Handle instead. This can opener is great. It's really easy to use and handles even the largest cans with ease. My mom was in the kitchen the other day and requested one for Christmas, as the crank handle made it easier on her arthritic hands. A very nice functional can opener. Easy to use a good size. We open a lot of cans so a good can opener is important. Thank you for your review, James! We are sorry this Garde COHH-LC Large Handheld Crank Can Opener has not worked well for you. A Customer Solutions Representative will contact you soon! This can opener is great. Works like a charm and we use it everyday. Would definitely buy again if we needed another one. Great quality. I like the crank on this for sure but the quality isn't the best. It does its job but only lasts a few months through everyday use. At this price its still worth the purchase. Thank you for the review! We’re sorry this is not working for what you need it for. We suggest trying this Garde COHHPVT Large Handheld Crank Can Opener with Pivot Handle instead. Great hand can opener. We open lots of cans for the concessions stand business and this can opener ia easy to use for all size cans. Its been a good Can Opener so far - handles all the cans I throw at it. I don't think it'll last me forever, but for the price I will gladly buy another. Crank turns with ease and hasn't gotten caught up yet. This large can opener is everything I wanted it to be - and that was a basic tool that didn't hurt my hand when I use it. The large crank makes this very easy to operate and I'm very happy with my purchase! Did not last more than two months. Seems very heavy duty. It wasn’t used much at all. Not worth the money I spent on it. Thank you for your review, Shane! We are sorry this Garde COHH-LC Large Handheld Crank Can Opener has not worked well for you. A Customer Solutions Representative will contact you soon! We have using ours for about 4 weeks and knock on wood works great. we have opened about 3 or 4 dozen #10 cans and a bunch of smaller ones. I purchased this as a back-up plan just in case we have any future issues with our electric can opener. I may end up using this one instead of the electric, as it is heavy and durable and gets the job done quick! I have struggled with all kinds of can openers, I thought I would give this a try, it works fast and easy. The first one broke the second one worked much better. This is a great can opener. It is easy to use and opens the cans quickly. It is built well. I would order another one. This product served us well as we were waiting for a manual can opener to come back in stock. Our frequent use was probably too much, and the product was not made for heavy use so it only lasted approx a month. Worked great while it was in use, and would likely hold up well for everyday light use. This can opener is a total waste of money.IT may be opens 6 cans and then it bent while i was trying to start opening a can. the handle is misleading being big so it turns easier again it's false.Once you start opening it does not turn the can for you to keep opening you have to physically turn and struggle to open.I bought 2 based on the description being the BEST of all the can openers on your website. Thank you for your review, K.T.! We are sorry this Garde COHH-LC Large Handheld Crank Can Opener has not worked well for you. A Customer Solutions Representative will contact you soon! This works pretty work overall and definitely better than a standard can opener. It does have a tendency to not catch the side so you can be turning the crank, but not actually opening the can more. Overall it is a decent product and gets the job done for us. This can opener is really easy to use. I have had trouble with can openers in the past, but with this one you just stick it on the can and turn the handle to use it. Love, love, love this can opener! My husband, who seldom talks about kitchen tools, has said several times this is the BEST can opener he has ever used. Love it so much I'm wondering if I can give them as little house warming gifts! I can see where the long handle would come in handy, however when trying to open standard can like from the grocery store, it's a recipe for sore knuckles. Since we have a commercial can opener for the large #10 cans, this one seems to stay in the misc. draw most of the time. A heavy duty handheld crank can opener that cuts through food can lids with relative ease. Very similar to the Swing-Away brand. After only a few uses, our kitchen staff is impressed with this Garde brand opener. No more trouble to open cans, this one is really easy to use, very resistant, great shape and grip, and the large handle works perfect!!! We are a small restaurant that doesn't use allot of canned products so we don't need the table top opener. We burned through what seemed like countless cheap hand held openers until we found this one. Great crank can opener by Garde. This is so easy to grip and turn. It's the best I've used. You can open cans very quickly and with little effort. You can't beat this price! A great quality product. 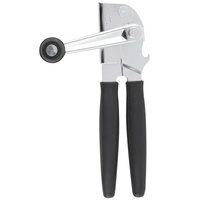 The can opener is easy to use and the grip is very comfortable, especially when you're opening several cans at a time. this can opener doesn't work too well. it's just as bad as the one I purchase at the 99 cent store. I would not buy again, I purchase 2 of it and it had already broken. This can opener is awesome. Never used a can opener that was so easy to use. Just may replace our expensive electric one. Opens #10 cans with ease. For the price you cant beat it. probably the best can opener i have ever owner. The blade comes in razor sharp and strong. And the fact that it has a crank instead it's takes so little effort to open cans! This is a good can opener for the price. Large handle with the coating makes it easy to hold even when my hand is slightly oily. The crank handle is way better than the small handle where you need to pinch. Highly recommended! This is a quality crank can opener for the price. Nice rubber grips make this comfortable to use. Long crank handle easily opens any can. Perfect for restaurants or home use. I love this can opener! It is replacing every one I own. I bought the same one at my local restaurant supply store for twice as much. This is the same product for half as much. Best can opener I've ever used. It's a perfect way to make sure that you are able to have cans open very quickly on the go. This handheld crank can opener works great so far. The price is excellent. We use it to quickly and easily open large cans of fruit and veggies. It doesn't take up any space like the table mounted kind. This is a nice can opener for the price. Large handle is easy to hold and smooth crank opens cans with ease. Rubber coated handle is comfortable to use too. Highly recommended! I purchased the Large Handheld Crank Can Opener because our current can opener was faulty. Not only does this new can opener replace the old one, is it far better. The cans open with ease plus my hands will not get tired. This crank can opener is a better choice than many items on webstaurant. It doesn't break after many uses! It also doesn't slow down at all.